Jaha Koo gives a touching insight into the tragedy of a lonely life in an increasingly technologized society. The Korean word golibmuwon (고립무원) refers to a feeling of “helpless isolation” characterised by the life of young people in present-day South Korea, Koo’s homeland. Societal problems such as youth unemployment and sexism are individualized, and a military, hierarchical social order allows no room for rebellion. Increasing suicide rates, isolation, a fixation on personal appearance, and the omnipresence of technology are just some of the symptoms. Koo’s personal experience of this sense of isolation occurred when his electric rice cooker’s speech function informed him that his meal was ready. In Cuckoo, the rice cookers are transformed into speaking performers, who take us on a bitter-sweet and humorous journey through the last twenty years of Korean history, combining personal experiences with political events, economic crises, loss and reflections on happiness. 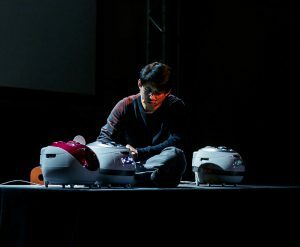 Jaha Koo is a South Korean theatre/performance maker and composer. His artistic practice oscillates between multimedia and performance, all of which include his own music, video, text and installation. Since 2014, Koo has been working on his Hamartia Trilogy, which focuses on our inescapable past and how it can tragically affect our current lives. After Lolling and Rolling in 2015, Cuckoo is the second piece of the Trilogy. Koo majored in theatre studies at Korea National University of Arts and studied at DasArts in Amsterdam.